Because we late season waterfowlers are dependent upon a migrating flock for the most part, we should not count out our ducks and geese until the season is over. It means we need to reserve places at commercial clubs and state sponsored hunting areas for those late season hunting dates. Maybe we need to be a little frugal too. This is especially the case for early season days when the return on investment might be a little skimpy. Most of our birds are born up north and things have been tough in recent years. Most of the ducks migrating into Illinois follow the Mississippi River and stop off on the Illinois River early. They move on to southern Illinois as the weather up north begins to deteriorate. Another factor is the lack of grain fields in many areas of the north. Summer drought can keep farmers out of the fields until a point where they figure their crop is a write-off. What does this mean for us? It is time to do a “snow dance”. Seriously, it means that we need to find hunting locations more to the far southern part of the Illinois or near the Ohio River. Private hunting clubs take up many of these areas but there are public hunting areas available. Because we are hunting late in the year, pressure from other hunters is lower. The ducks and geese respond more to smaller spreads of decoys than to the large fields of dekes often employed early in the season. 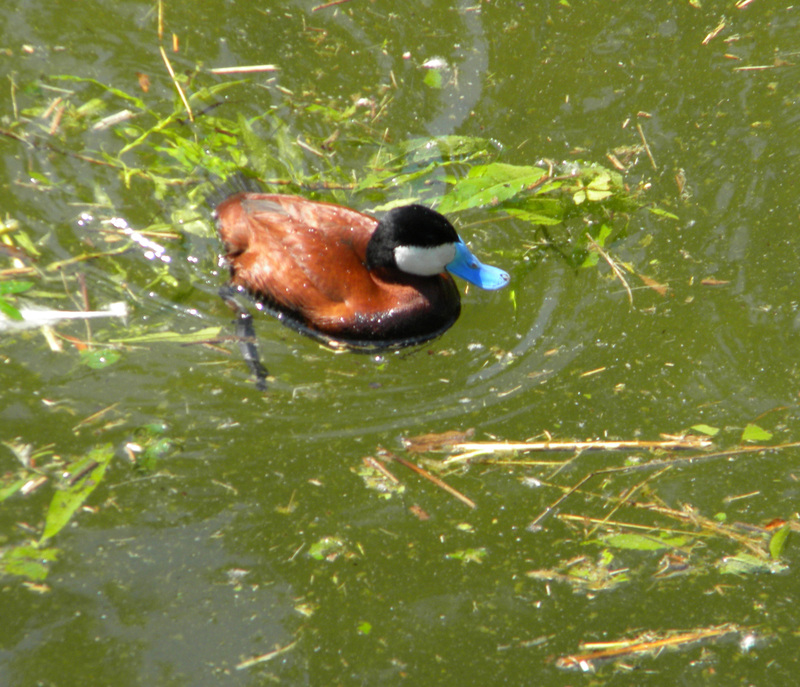 The frugal hunter can get by with a few decoys strategically placed on small bodies of water. This means less spent on decoys. He often can buy the unused shotgun shells of early season hunters for a reduced cost. 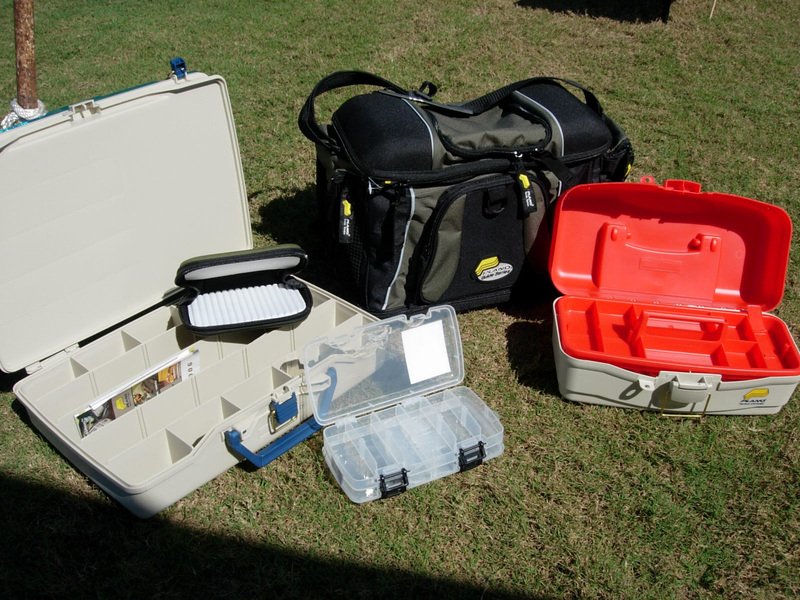 Sporting goods dealers often have end of the season sales of gear and ammo providing an additional savings. Need a place to hunt, check with local landowners who now have their crops harvested and might let you hunt for free. The Union County State Fish and Wildlife Area and Horseshoe Lake State Fish and Wildlife Areas require a purchased permit. Those under 16 can hunt for free. This is an example of some of the inexpensive hunting available. Even those areas where permits are for the year can have cheap hunting on weekdays. An example might be a location with blinds allocated and the person assigned to that blind might not be able to hunt every day. On those days when the assigned person is not using the blind others can use it on a first come first served basis. Check with the site superintendent to get the details that apply to the area you wish to hunt. Williamson County Bureau of Tourism (1-800-GEESE-99) has a free brochure on waterfowl hunting opportunities in that area. It contains names and addresses of hunting clubs in the area as well as information on hunting the Crab Orchard National Wildlife Refuge 618-997-3344) near Marion. Additional information about the refuge hunting opportunities is available from the Refuge Visitors Center, 8588 S. Illinois Route 148, Marion, IL 62959. Frugal duck and goose hunters can still enjoy their sport at minimal cost if they just do a little research and are willing to hunt on weekdays in public hunting areas. Check it out. 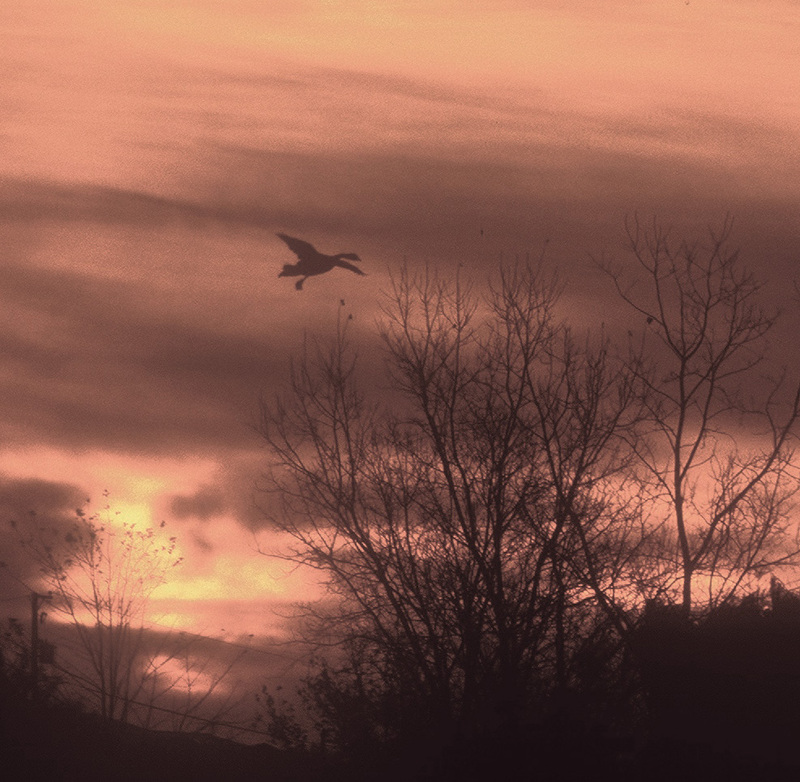 Flocks of ducks and lines of geese crossing the winter skies provide a reassurance of winter being on the way to southern Illinois. A little behind the northern part of the state, and perhaps milder, winter still means waterfowl hunting aplenty. Skilled and novices hunter attempt to lure birds from the flock into gun range of their hiding places in the fields and watery areas. Daily the birds lift off from the protection of the refuges in search of food in far distant grain fields. Most return each evening to spend the night. This is winter in this part of the state. The birds will repeat the cycle again tomorrow. With commercial hunting clubs that cater to the needs of waterfowl hunters on a daily basis, southern Illinois also has public access areas for the freelancer with a boat and dozen decoys. 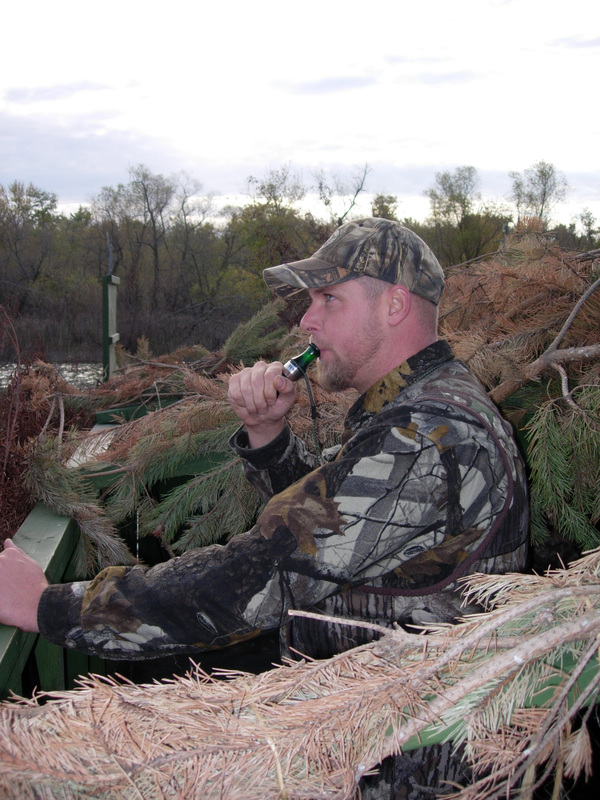 Hunters, who check with local Chambers of Commerce and tourism bureaus, can still find low cost waterfowling. 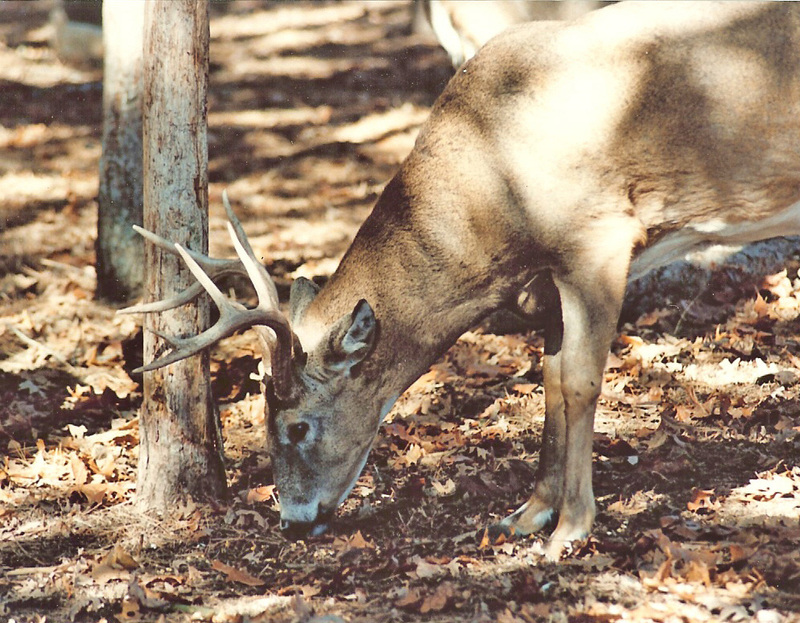 The public access areas of the Crab Orchard National Wildlife Refuge consist of two types: Public Hunting and Controlled Hunting Area. Those wishing to use the Public Hunting areas are required to possess a Recreational User Permit ($2 per day) which can be purchased at the Visitors Center on Route 148 about two miles south of Illinois Route 13 on Route 148. Only temporary blinds can be used in these areas. They must be removed at the end of each days hunt. Both water and ground blinds must be at least 200 yards apart and can contain up to five hunters. Generally speaking, the open hunting area lies at the west end of the refuge property. The Controlled Hunting area is located just south of Route 13, between the open and closed areas of the refuge. It consists of 14 water and 15 land blinds. There are also 2 handicap accessible blinds which are available on a reservation basis. Physically challenged hunters with a Class II Disability Card can reserve one of the two blinds for up to 5 days per month. For details contact the Refuge at 618-997-3344. All hunters, regardless of the area in which they hunt, are required to have an Illinois General Hunting License, Federal Waterfowl Stamp and Illinois Waterfowl Stamp. Local sporting goods, bait shops, and other venders in the area have an ample supply of all of these. Licenses are also available on line at the Illinois Department of Natural Resources website. Free information about the Refuge and hunting programs can be obtained from the Visitors Center at the phone number listed above. A free color brochure on hunting in Williamson County is available from Williamson County Tourism Bureau, 1602 Sioux Drive, Marion, Illinois, 62959. Their phone number is 1-800-GEESE-99. Information is also available on line at: or by email to: info@visitsi.com. Are you looking for reel screeching runs from a big brawny fish that is sure to break tackle? The striper is hard to beat. 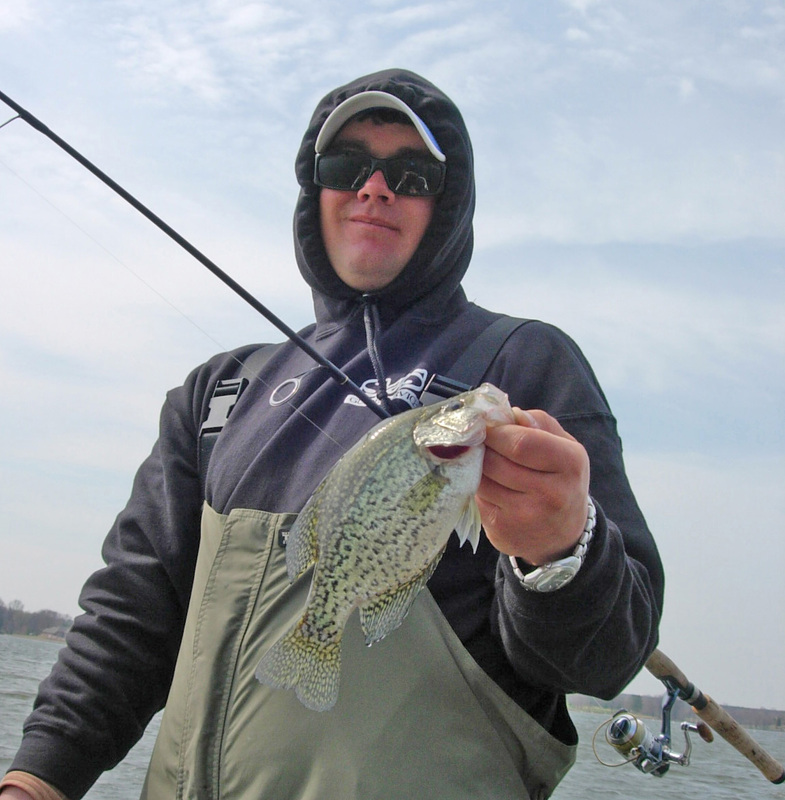 For anglers in a number of Illinois lakes these transplants pay big dividends in fishing action. The striper is a saltwater relative of the white bass. It resembles the white, but is more elongated and less compressed with a nearly straight back. The color of the striper is a dark greenish to bluish on top with sometimes a brassy tinge that becomes lighter on the sides. The underside is silvery. Most prominent are the seven to eight narrow stripes along the sides going lengthwise giving rise to their name. Weights vary, but generally they reach about 5 pounds by their third year. Anglers are now catching fish in the 20 plus range. Originally a salt water fish that returned to freshwater only to spawn, the striper became popular with freshwater biologists in the 1940’s. When Santee Cooper Lake in South Carolina became an impoundment it trapped some stripers that had gone up the river to spawn. The fish thrived in this freshwater environment as they gobbled up the numerous shad of the lake. Biologists taking note of the situation began to stock them in other large freshwater lakes in the eastern U.S. The successful stocking efforts created a new fishing opportunity for open-water anglers on large reservoirs. Stripers do not usually reproduce naturally in fresh water and require restocking by local state fishery departments. Myths about stripers depleting populations of other game fish are false. Biological study or surveys have established this fact. Feeding on gizzard shad, they provide a service to the other populations of game fish in that they are the only predator feeding on the larger shad which are too big for other predators. Adult stripers eat primarily shad and do not eat spiny fish like black bass, white bass, or crappie. One key to locating stripers seems to be stable water levels. 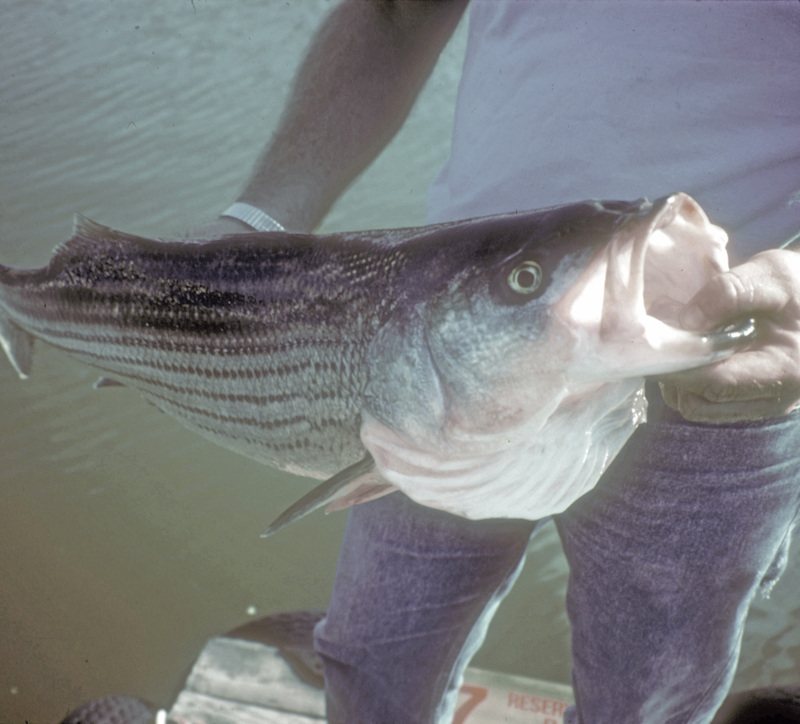 In the early days, local anglers caught some of the stripers, but not consistently. The marauding schools moved up and down the lakes. Although stripers spend most of the year roaming deep open water in pursuit of shad, they seem to be fond of the dam tailwaters. 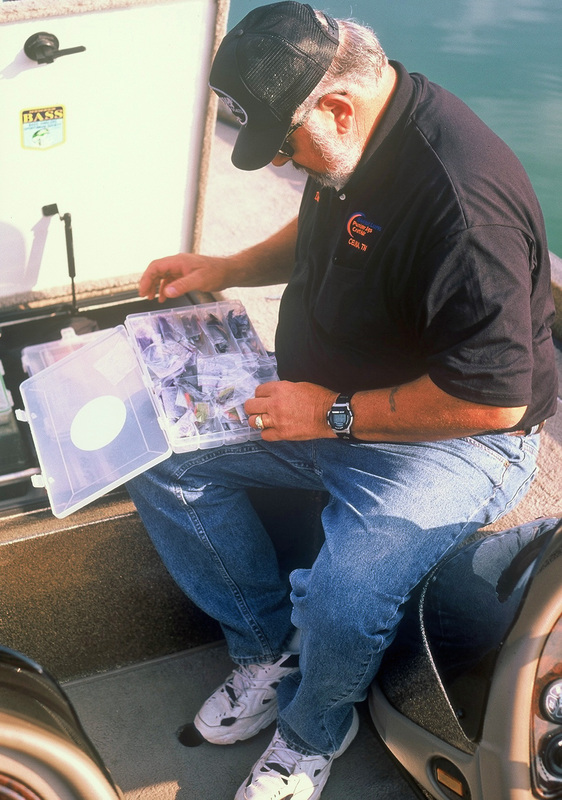 Anglers move in and cast both lures and live bait into the fast moving waters. Heavy bass gear will work for these fish. A medium or heavy rod and bait‑cast reel with 15 plus pound monofilament line will work well. A 7 foot rod with a flexible tip is a good choice. The flexible tip allows the fish to grab the bait without meeting with a lot of resistance before they are safely hooked. The fish’s voracious eating habits allow it to gobble up the bait before the angler is even aware of the strike. They hook themselves. The bait on a 2/0 to 4/0 circle style hooks seem to be the most popular. Some stripers will take topwater lures such as the Cordell Redfins trolled in the early morning hours. Later, one can move up close to dams and locks to cast large jigging spoons and Sassy Shad. One ounce jigs with plastic bodies in pearl or white seem to work well. Electronics locate the large schools of fish as they chase the shad. Once a school is located, anglers either jig or trolls lure or live bait on downriggers. The jigging is more exciting and productive. Downstream from dams or locks rip rap banks attract stripers. The gizzard and threadfin shad are attracted to the plankton and algae in the rocks. The stripers follow them in and feast on the shad. Basically, the striper will go anywhere that there is a current break and a good food supply. Fishing for stripers is an exciting sport and if you decide to keep a couple, they are excellent eating. On the third Saturday of September for the past 13 years I have sponsored the youth goose calling contest at the Southern Celebration of National Hunting & Fishing Day on the campus of John A Logan College, Carterville, Illinois. I do not sponsor it for any personal gain other than a chance to see youngsters have fun carrying on the calling traditions of their parents. The judges for the contest donate their time and pay their own travel expenses. 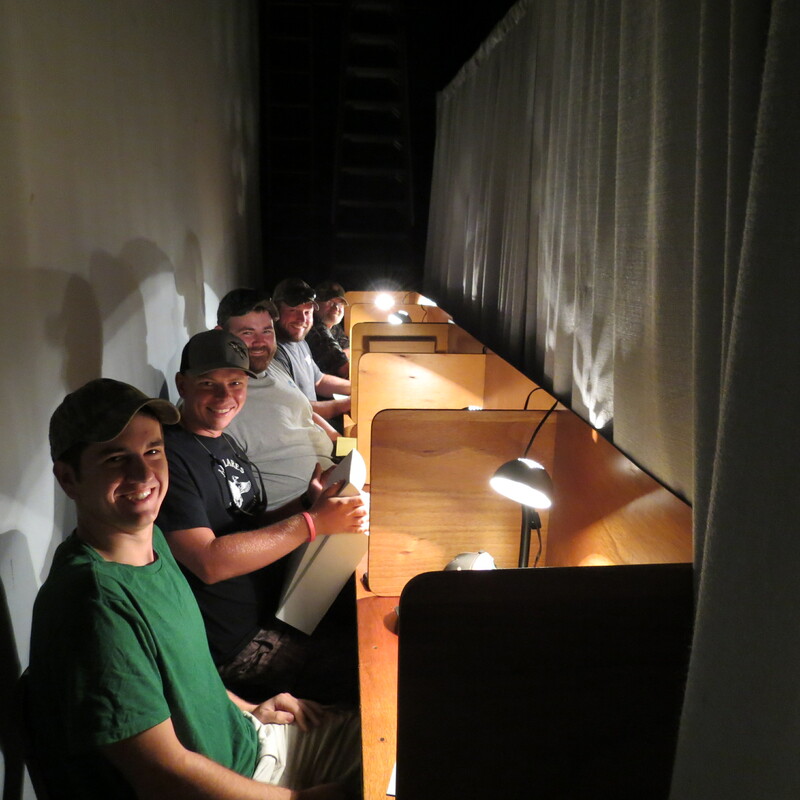 The judges are sequestered behind a curtain on the stage. They cannot see the participants and the callers must not talk while competing. This year’s judges were Michael Ritter, David Renfro, Zach McCurdy, Gabe Evrard and Cory Niccum. All are national known winners of calling contest around the country. Contestants are divided into two age categories named juniors and Intermediates. They participate under the same rules as adults in similar calling contest nationwide. Each judge scores the participants presentation. The highest and lowest scores are thrown-out and the three in the middle become the callers score. The youngsters draw numbers from a hat to select the order in which they participate. The drawing is held again for the second round. The contestants call twice as a minimum. If there are any ties a call off it presented. This year’s winners in the Junior category are Payton Wottowa (1st), Hunter Chapman (2nd) and Audrey Ham (3rd.) The winners in the Intermediate category were Ty Draper (1st), Caleb Ham (2nd) and Alex Webb 3rd.) 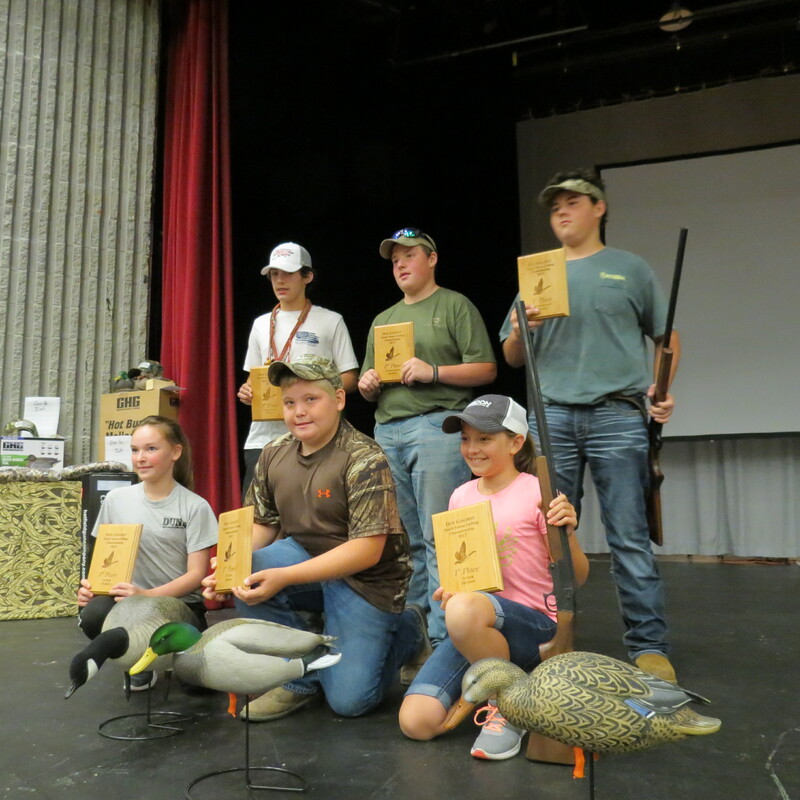 They all received a huge amount of waterfowl related merchandise and the first place in each category also received a shotgun.